Are you concerned about hair lacking volume and loosing its vitality? Are you suffering from a dry and tense scalp? Does your hair lack density and feel dry? Do you find your style doesn t last as long as it used to. If the answer is yes to these questions then you may want to consider Kerastase s Age Premium range. 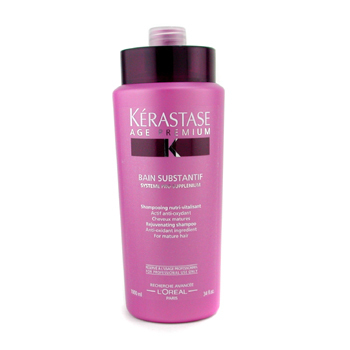 Lait Substantif is a light replumping rinse out conditioner. Enriched with collagen this conditioner helps to replump and contour the hair fibre without weighing it down. Hair is left nourished, revitalized and thickened. Scalp is left moisturized and balanced. Age Premium is Kerastase s first collagen enriched haircare programme for mature hair. Already well known as a premium ingredient in luxury skincare products, for the first time Kerastase reveals the remarkable revitalising properties of collagen for the hair. For optimum results collagen has been combined with Pro-Supplenium system.